The film opens with three young boys playing a game of catch with a football. Luke (Nicholas Zoto), puts up with some taunting from Billy (Liam Barnett), regarding the lack of his athletic prowess. The other boy, Dom (Michael Dostillio), seems a bit easier going. After Billy and Dom leave the playground, Luke, feeling dejected, walks over to the swing sets, sits down on a swing, and begins to eat candy corns. While sitting, he looks down at the ground and notices in the sand, what appears to be, a partially obscured jack–o‘-lantern. No sooner does that happen, then a mysterious, older girl, who has seemingly come out of nowhere, begins speaking to him. She lets Luke know that Billy is nothing special, and that he shouldn’t concern himself with his rude comments. Luke remarks that he likes the colors the girl is dressed in, that orange and black are Halloween colors. The two exchange names. The girl Luke is talking to is named Charlotte (Catherine Kustra). He offers her some of his candy corns, which she happily accepts. During their conversation, Luke lets Charlotte know, that one time, he, Billy, and Dom took some candy corn to a graveyard. The reason they did it was because Billy said that he read in a book that dead people like to eat that type of candy. Billy furthered his fabrication by telling Luke and Dom, that if they left candy corns on the graves of the deceased, that their ghosts might come out and talk to them. Of course, the whole thing was a practical joke arranged by Billy, who was aided by his sister. When Luke expresses to Charlotte that he feels that the dead can probably hear when people speak to them, she replies that the dead probably can hear all kinds of things. The statement seems to disturb Luke a bit, so he tells her he has to go. Luke arrives home, where he lives with his stressed-out, single mother, Marie (Christie Parker). She informs Luke that he is late. When he apologizes, and tells her he was talking to a girl named Charlotte, who he’s dubbed ‘The Halloween Girl,’ Luke’s mother seems visibly shaken, and almost drops the dinner she was cooking onto the kitchen floor. Marie hastens to change the subject, and instructs Luke to eat his dinner. The scene next shifts to Marie watching television. She is drinking a glass of liquor, and before too long, she falls asleep and has a nightmare. During her unpleasant dream, Luke is calling out to her, to come save him. He goes so far as to say to Marie that she is the only person who can save him. Marie searches for Luke, and while doing so Charlotte appears. The friendly voice she had been talking to Luke in at the playground, is now altered and sounds borderline demonic. Charlotte demands that Marie tell Luke the truth. The truth about what, however, is not specified. Afterward, when Luke and Marie speak, they find that Charlotte appeared in both of their dreams. The next day a conversation Marie has with her friend Karen (Carol Anne Raffa) during lunch sets up the remainder of the film. Marie confides in Karen, letting her know that Luke once had an older sister. The girl, whose name was Charlotte, was killed by a drunk driver a short time after Luke was born. The date of the accident which claimed her life took place on Halloween. Karen, attempting to be a good friend, tries to assure Marie, that she’s reading into things too much because she’s stressed out about not having a job. While Marie wants to believe that to be the cause of her perpetual anxiety, and tries to move forward with her life, she finds it increasingly difficult. Charlotte is not about to relent, and is haunting Marie at her every turn. What is the hidden truth that Charlotte wants Marie to tell Luke? Is she Luke’s sister? Is she a sister he never had an opportunity to spend time with and get to know? Is Charlotte angry that Marie hasn’t even told Luke that he once had a sister? Does Marie want to keep Charlotte’s life a secret from Luke, so she doesn’t have to confront the reality of what took place years earlier on Halloween? Why is Charlotte nice to Luke? “The Halloween Girl” was written and directed by Emmy winner, Richard T. Wilson (Maple Ave). The film had its video premiere on October 1, 2015. The short film is well paced, and comprises the genres of drama and horror. The acting comes across as genuine. Furthermore, the dialogue is not forced, nor riddled with exposition. For me, the best part of the short film, was that it took itself in a direction that I don’t think a great many other films of its kind would have taken. In my opinion, the direction Richard T. Wilson took the film was interesting, entertaining, and didn’t adhere to convention. If you enjoy well made short films, in the horror genre, that are psychological as opposed to offering outright scares, I would suggest investing the under twenty minutes it takes to view the film. This entry was posted in Movies and tagged Carol Anne Raffa, Catherine Kustra, Christie Parker, Liam Barnett, Michael Dostillio, Nicholas Zoto, Richard T. Wilson, The Halloween Girl. Bookmark the permalink. 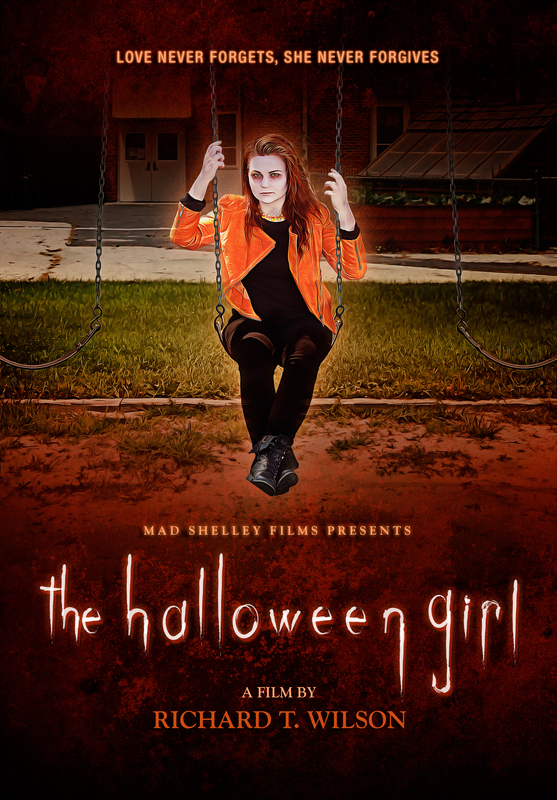 My pleasure; I enjoyed watching “The Halloween Girl.” I though it was very well done, and had an interesting twist. I would very much like to receive a screener copy of “Under the Flowers.” Please let me know where I can e-mail you my address. I look forward to seeing the web series.